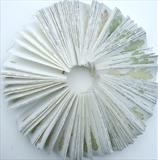 A collection of garden herbs embossed into Somerset paper; their juices and some parts of the plant material absorbed by the paper. Unbound but contained by a folder of black Somerset paper. Sold, but others similar can be made to order. 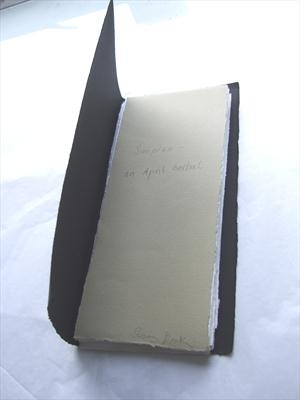 This is an original artist's book. Made in April 2011, it records 16 herbs at the point at which they were embossed, leaving their juices and some of their solids on the paper. These squeezed plant fluids spread down their length traces an ephemeral path across the pages. The herbs' common names and dates of embossing are written in pencil at the top of each page. Although essentially unrepeatable, other herbals can be made with similar qualities.